Knowing I’ve got Petplan Equine behind me takes the stress out of an already really stressful situation, should anything happen to my horses. 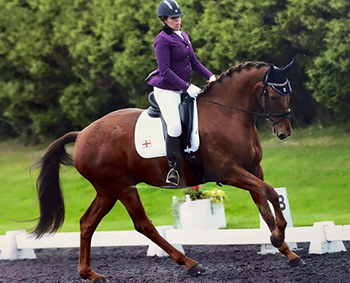 Heather Finlay is from Tyne and Wear and competes in dressage with her 8 year old gelding Taz, at Medium and Advanced Medium level. Heather’s horses are her top priority and her life revolves around them. Heather owns six horses, including Anthem, now retired after competing to Advanced Medium level and Little Legs, a miniature rescue Shetland who is the boss of the yard! Her main horse is Taz, a 17.1hh gelding who she is competing at Medium level. Heather also owns a four year old called Leckie, who she backed last year and two new colt yearlings. Qualify for Elementary and Medium Regionals and Petplan Equine Area Festivals. Do more Advanced Medium tests with Taz. Compete in 4 year old classes with Leckie and qualify for the Petplan Equine Area Festivals at Novice level.